The 10th Annual Operation Backpack is starting next Monday, July 15. Help children living in NYC’s homeless and domestic violence shelters with getting their school supplies. Check out the list of supplies for each grades here and fill a backpack up. You can drop them off at any Duane Reade store in the five boroughs from July 15 to August 9.
thank you mommypoppins for sharing the news. From now through August 6, Ben & Jerry’s Truck is giving out FREE ice cream samples but here’s the catch: You need to Tweet at them @benjerrystruck and beg them to drop by your area. Have fun with it! 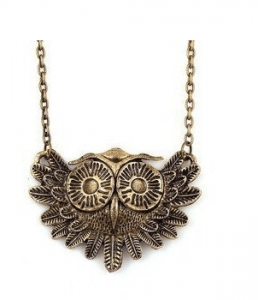 Amazon: Vintage Owl Necklace $.64 Shipped! Prices can change on Amazon at any time without notice. The Dream on Me Aden Convertible 3 in 1 Mini Crib is a great crib for small nurseries or shared spaces and right now you get it for only $117.61 at Amazon. This is the best price the Aden Mini Crib has been for all year. It converts into a toddler bed and a twin sized bed so it will last you for quite awhile. You might want to check out the Dream on Me Portable Crib Mattress that goes with it since you’ll need a smaller mattress for this mini crib. Hanna Andersson’s Backpack Store Sale has started. You will find four different backpack sizes priced between $20 – $28. Also on sale are lunch bags and accessories such s stainless bottles, food containers, pencil cases and other coordinating accessories. Standard shipping starts at $5.95. Save 38% on the Brilliant Beginnings Safari Play Mat, Free Shipping Eligible! The Brilliant Beginnings Safari Play Mat is on sale for $25.00 at Walmart.com right now. That’s 38% off the list price of $40.00! Shipping is free if you ship to store or local FedEx location! Head on over to USToy.com where they are offering up a $1.99 and below super sale! Even sweeter, shipping is always FREE… but keep in mind, you will need to spend a minimum of $25 or else you’ll have to pay a $5 handling fee. Calling all you prego Hip2Savers and/or those of you with little ones! Today only (or while supplies last! ), head on over to Amazon and check out their Gold Box Deal of the Day to score 20% off a large selection of Fisher-Price Baby Gear including high chairs, rockers, swings and more! Many of this gear is priced at the lowest it has ever been and is very highly rated too! Plus, shipping is FREE with Super Saver Shipping on a $25+ purchase OR snag FREE 2-day shipping (no minimum) with Amazon Prime (check out this post for more information on how to score a 30-day free trial of Amazon Prime). Here are a few deals highlights….